Coach Tony Bloomfield meets with his team during a time out in the game against ARC on March 30. 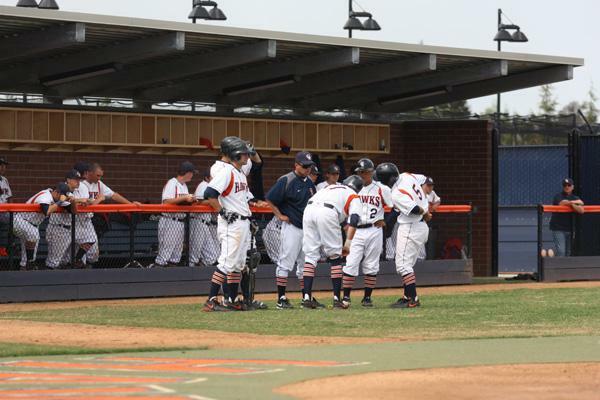 After a five-game losing streak, the Cosumnes River College Hawks picked up a win against the American River College Beavers on March 30. 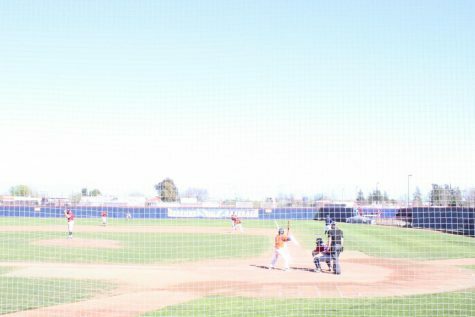 Hawks’ freshman pitcher Kyle Von Ruden let ARC’s sophomore outfielder Greg Harris score in the first inning of the game, but Von Ruden did not let that stop him from striking out two more players. 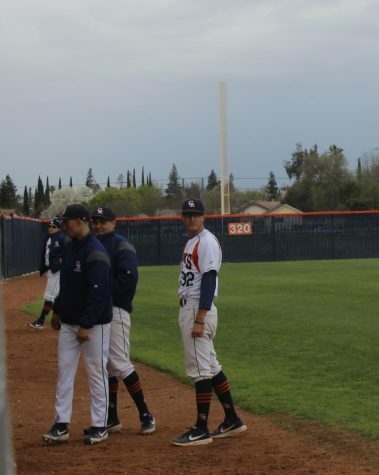 In the bottom of the first, the bases were loaded and much to the disappointment of the fans, no runs were scored for CRC until the bottom of the second by freshman outfielder Josh Cosio after freshman infielder Hunter Carolan hit a double, leaving the score at 1-1. 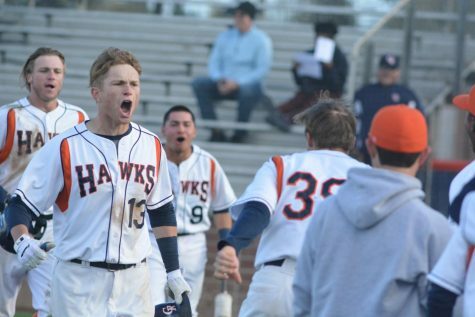 The third inning was in the Hawks’ favor as sophomore catcher Bryan Case hit a double, followed by a double from freshman first baseman Cole Ebner. Case scored a run, resulting in a 2-1 score. 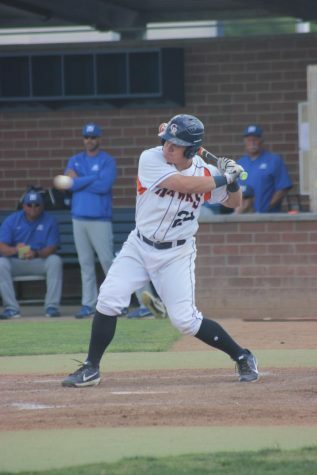 With Ebner and sophomore outfielder Colby Wilmer on base, Cosio went up to bat and hit a triple, enabling Ebner and Wilmer to score two more runs for the Hawks. 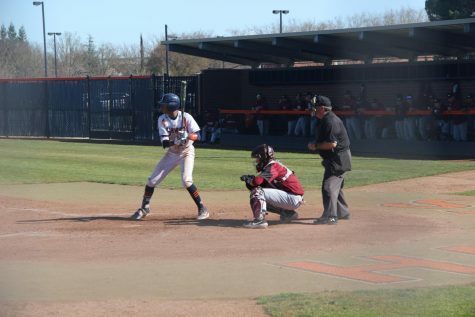 Freshman shortstop Michael Chavarria hit a single, helping Cosio score another run for the Hawks. After a quick change of pitchers from ARC, the Hawks struggled for only a minute as Chavarria scored another run before executing two more outs, bringing the score 6-1, Hawks favor. The Beavers stepped up their game in the top of the fifth as freshman catcher Wade Brill scored ARC’s second run of the game. Shortly after that, sophomore infielder David Cooley scored the third run of the game for ARC. 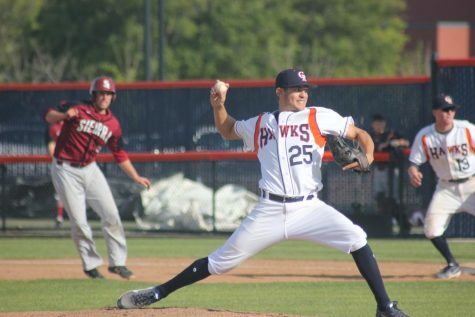 The Beavers prevented the Hawks from scoring any runs in the bottom of the fifth as they changed pitchers right in the beginning of the inning. In the top of the sixth, Von Ruden was relieved by sophomore pitcher Blake Harrison. Harrison allowed for four runs to be scored by ARC, leaving the score at 7-6 in the Beavers’ favor. Hope looked slim for the Hawks in the top of the eighth as ARC scored their last run of the game, leaving the score at 8-6. 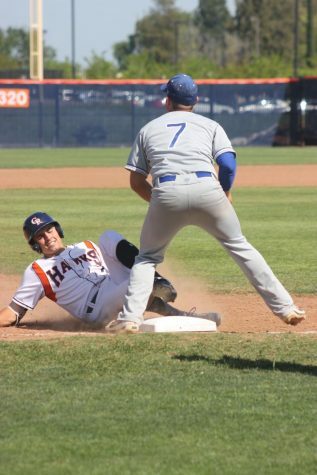 With a new pitcher for ARC, the Hawks continued to show determination as the bases were loaded in the bottom of the eighth. 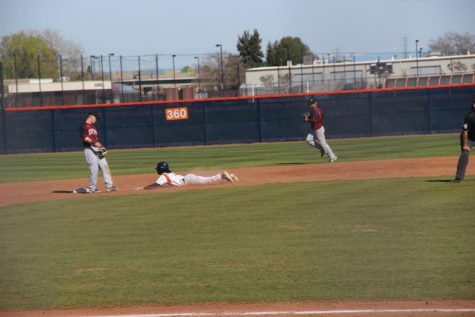 As freshman pitcher Cody Morris walked to first, freshman infielder Adam Castelan scored a run for CRC, bringing the score 8-7. 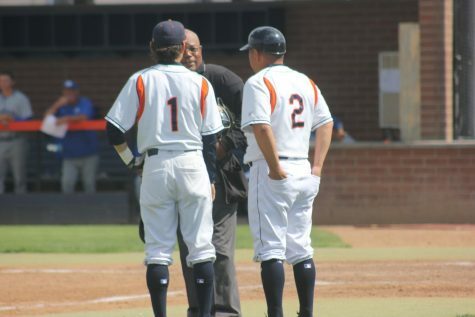 As the inning continued, Wilmer hit a single, resulting in two more runs scored by sophomore first baseman Garrett Heisinger and Case, as the Hawks’ took the lead 9-8. 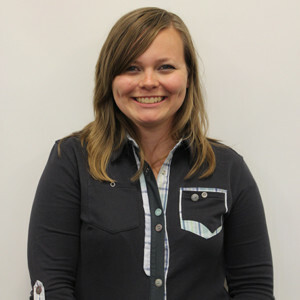 “I feel I did alright. Thank god that I had the opportunity to come in with bases loaded in the last and get the base hit that helped us go ahead,” Wilmer said. Harrison pitched for the top of the ninth inning and worked with the team to get the runners out at first. The game ended with a score of 9-8, Hawks favor.